On June 14, exactly five weeks from today, Iranians will flock to the polls to elect a new president to succeed Mahmoud Ahmadinejad. Candidate registration started Tuesday and ends tomorrow, Saturday. Iran’s Mehr news agency put the number of hopefuls who had already registered by Thursday night at 243. 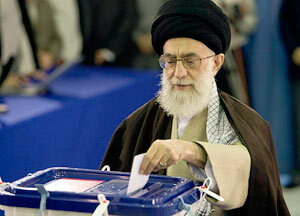 An adviser to Iran's Supreme Leader Ayatollah Ali Khamenei was one candidate who joined them earlier today. By registering to run, lawmaker and former parliament speaker Gholam-Ali Haddad-Adel becomes the first of a trio of Khamenei loyalists to do so. Allied with Haddad-Adel, 68, are former Foreign Minister Ali Akbar Velayati, 67, and Tehran mayor Mohammad Bagher Ghalibaf, 51. Iranian media say two of them will step aside later in favor of whoever appears to have the best chance of winning the election. Velayati is another top adviser to Khamenei on international affairs. He served as foreign minister during the 1980-88 war with Iraq and into the 1990s. He is a physician and runs a hospital in north Tehran. Charismatic Tehran Mayor Ghalibaf is a former commander of the Revolutionary Guards during the Iran-Iraq War. Among other candidates who registered on Friday was reformist Mohammad-Reza Aref, who served as vice-president under former moderate President Mohammad Khatami. Khatami, who was elected in landslide victories in 1997 and 2001, has not made clear whether he will run this time. Another prominent figure Hassan Rowhani, Iran's former nuclear negotiator and confidant to ex-President Ali Akbar Hashemi Rafsanjani, also put forward his name. Rowhani's allies say he will withdraw his application if Rafsanjani decides to run for president. Both Rafsanjani and Khatami, whose moderate candidacies would radically alter the contest, appear reluctant to stand unless given the nod from Khamenei but neither have ruled themselves out. "I will not enter the field without his consent," Rafsanjani said this week, according to the Mehr news agency. "If circumstances are such that there will be conflicts and disputes between me and the leader, we will all lose." More conservatives than reformists have put themselves forward as candidates, reports say. The Guardian Council decides who can stand. In 2009, 475 hopefuls registered as candidates, but the Guardian Council, whose 12 members are either directly or indirectly appointed by Khamenei, only gave its approval to four. The final list of candidates will be unveiled later this month, around May 23. "The rules set for the election excludes many who might have been able to stand under normal circumstances. The entire opposition, ranging from Communists to monarchists and passing by nationalists and liberals, are branded as 'enemies' and excluded," Amir Taheri writes today in his weekly column for the Saudi daily Asharq Alawsat. Half of the population -- women -- is barred from running. Only men can register as candidates. Although legally recognized as religious minorities, Christians, Jews, and Zoroastrians -- altogether numbering around one million altogether -- are also excluded. So are 300,000 from the Baha’i Faith, on grounds of belonging to an "illegal" religious minority. Being Muslim is not enough to make you eligible to run for president. Iranian Sunni Muslims, believed to number around 12 million, are barred from running. “The would-be candidates must be Shiite Muslims,” the Interior Ministry declares. Not all Shiite denominations are accepted. The “Seveners” or Ismailis are excluded, as are Zaidis, not to mention smaller esoteric offshoots of Shiism. However, being a “Twelver” (Ithna’ashari) is not enough either. The candidate must be a political or religious figure and believe in the core tenets of the Islamic Republic. This means, for instance, a businessman, an opera singer or a taxi driver, cannot seek the presidency. Clearly, such conditions would give the authorities ample opportunity to block the candidacy of figures considered a threat to Khamenei.